If you use Mac OS X 10.4, you can usually determine whether crashes you encounter are severe security holes in seconds, even if you are not a C++ developer or do not have access to the source code of the application that crashed. Here's how. To prepare, type "defaults write com.apple.CrashReporter DialogType developer" into a Terminal window. 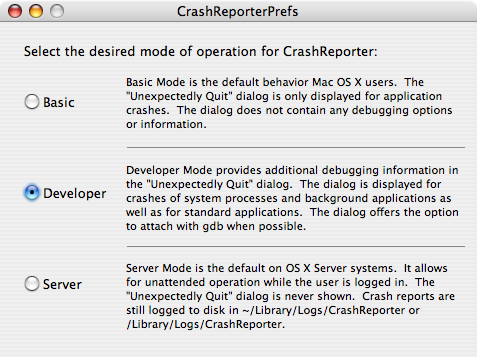 (Or, if you have CrashReporterPrefs installed, you can do this using a GUI.) This makes several changes to the dialog that appears when any application crashes. 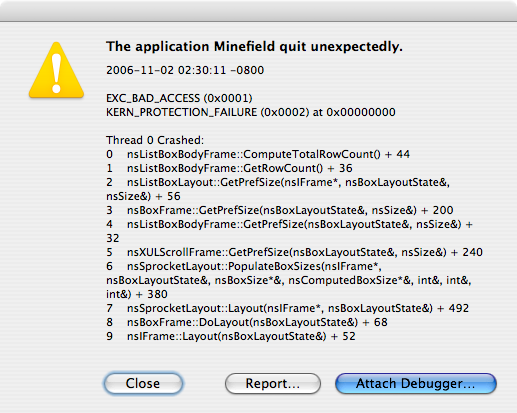 The most important change is the addition of a partial stack trace to the dialog that appears when applications crash. The stack trace tells you which function the crash occurred in, which function called that function, and so on. Another nice feature of "Developer" mode is that a crashing application's windows stick around until you click "Close" instead of disappearing immediately. This gives you a chance to salvage unsaved data that was visible when the application crashed. To try out Crash Reporter, find a crash bug report in Bugzilla, such as this null dereference or this too-much-recursion crash, and point Firefox at the bug's testcase. Now, instead of seeing a Basic crash dialog, you should see a Developer crash dialog with the first ten lines of a stack trace and other debugging information. 1. Look at the top line of the stack trace. If you see a hex address such as 0x292c2830 rather than a function name such as nsListBoxBodyFrame::GetRowCount at the top of the stack, a bug has caused the program to transfer control to a "random" part of memory that isn't part of the program. These crashes are almost always exploitable to run arbitrary code. 2. Look at the last line above the stack trace, which will usually be something like "KERN_PROTECTION_FAILURE (0x0002) at 0x00000000". The last number, in this case 0x00000000, is the memory address Firefox was prevented from accessing. If the address is always zero (or close to zero, such as 0x0000001c), it's probably a null dereference bug. These bugs cause the browser to crash, but they do so in a predictable way, so they are not exploitable. Most crashes fall into this category. 3. Check the length of the stack trace by clicking the "Report..." button. If it's over 300 functions long, it's likely to be a too-much-recursion crash. Like null dereferences, these crashes are not exploitable. Any other crash where Firefox tries to use memory it does not have access to indicates some kind of memory safety bug. These crashes can often be exploited to run arbitrary code, but you can't be as certain as in the case where you see a bogus address at the top of the stack in step 1. If you encounter a crash in Firefox that looks exploitable, please take the time to figure out how to reproduce the bug, create a reduced testcase if you can, and file a security-sensitive bug report in Bugzilla. After filing the bug, attach the crash report generated by Mac OS X, pointing out what makes the crash look like a security hole. If a crash bug looks exploitable based on the stack trace, Mozilla's security group assumes it is exploitable. You don't have to learn machine language and construct a sophisticated demo that uses the bug to launch Calculator.app to convince us to take such a bug seriously and fix it. The same is true for Apple's Safari team in my experience. If you use Windows or Linux, you can't use the Mac OS X Crash Reporter, but you can use Talkback instead if you want to see stack traces for Firefox crashes. Installing Nightly Tester Tools gives you a menu showing your recent crashes, but it's still not quite as efficient as the Mac OS X trick, and depends on the Talkback server being in a good mood. Talkback was developed before developers knew so many types of crashes were exploitable, and it's primary purpose is to determine which crashes are the most common, so it does not show you which memory address Firefox was denied access to. This prevents you from distinguishing likely null dereferences from some severe memory safety bugs (step 2 above). This entry was posted on Thursday, November 2nd, 2006 at 7:05 am	and is filed under Mozilla, Security. You can follow any responses to this entry through the RSS 2.0 feed. Both comments and pings are currently closed. Gen Kanai pointed out that CrashReporterPrefs doesn’t come with all Mac OS X installs, so I changed the instructions to mention “defaults write” instead.